Originally a whaling station, Tangalooma Island Resort (formerly known as Tangalooma Wild Dolphin Resort) is a resort on the west side of Moreton Island in Queensland, Australia. On the 18th (Fri), enjoy the sea views from Cape Moreton Lighthouse. To find maps, other places to visit, ratings, and tourist information, use the Tangalooma vacation builder. London, UK to Tangalooma is an approximately 29-hour flight. Traveling from London to Tangalooma, you'll lose 10 hours due to the time zone difference. Traveling from London in August, expect slightly colder with lows of 11°C in Tangalooma. Wrap up your sightseeing on the 19th (Sat) to allow time to travel to Surfers Paradise. The main appeal of Surfer’s Paradise can be identified from its name alone. Attractions like Sea World Theme Park and Surfer's Paradise Beach make great kid-friendly stops. You'll find plenty of places to visit near Surfers Paradise: Currumbin Wildlife Sanctuary (in Currumbin) and Dreamworld (in Coomera). The adventure continues: get in on the family fun at Warner Bros. Movie World, race across the water with a speed boat tour, stroll through Burleigh Heads Beach, and admire the masterpieces at Opal Gallery. For traveler tips, more things to do, ratings, and other tourist information, refer to the Surfers Paradise travel itinerary creator. Traveling by car from Tangalooma to Surfers Paradise takes 4.5 hours. 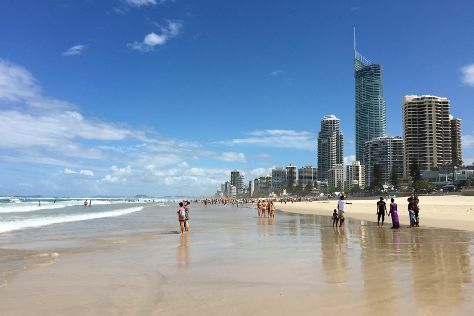 In August, daytime highs in Surfers Paradise are 25°C, while nighttime lows are 11°C. Wrap up your sightseeing on the 23rd (Wed) to allow time to drive to Brisbane. Family-friendly places like Lone Pine Koala Sanctuary and Brisbane Botanic Gardens Mt. Coot-tha will thrill your kids. 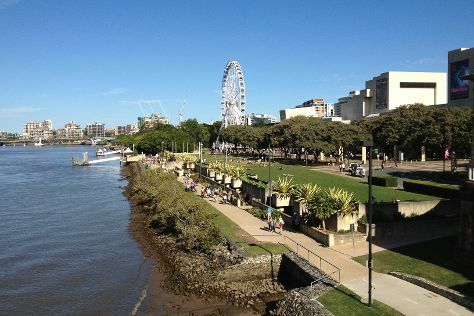 The adventure continues: enjoy some diversion at South Bank Parklands, take some stellar pictures from Mount Coot-tha Lookout, admire the masterpieces at Gallery of Modern Art, and take in nature's colorful creations at City Botanic Gardens. For where to stay, other places to visit, more things to do, and other tourist information, use the Brisbane travel planner. Getting from Surfers Paradise to Brisbane by car takes about an hour. Other options: drive; or take a bus. In August, daytime highs in Brisbane are 25°C, while nighttime lows are 11°C. Wrap up your sightseeing on the 25th (Fri) to allow time to travel back home.